The following review was conducted in January 2011, and information on subsequent software updates and new version releases may not be reflected within. This review predates OnSIP’s mobile app for iOS and Android, free to OnSIP users, so is not affected by bias. Acrobits is a mobile software company primarily focused on mobile SIP clients. 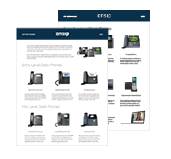 Groundwire iOS is the business version of its Acrobits Softphone and is marketed as a viable replacement for desktop phones.